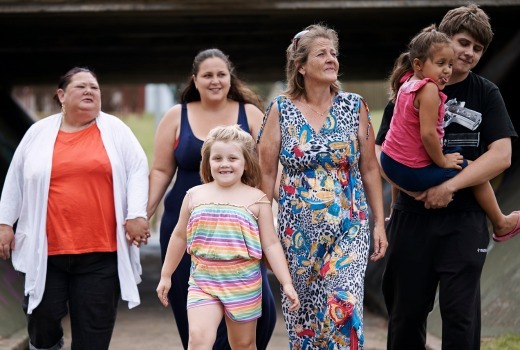 Struggle Street concluded last night with more bumper numbers for SBS. It averaged 828,000 across two episodes (SBS did not split into 2 as commercials so often do). That gave it a win in its timeslot and the 3rd best performer in Sydney all night (and was the top non-News show). The show helped SBS to a 12.2% network share for Wednesday -better than the 9.7% for its first outing and their biggest share all year. Struggle Street was also #2 in key ratings across Wednesday and has emerged with more positive press today now it has concluded. In the 7:30 Reality battle MasterChef remains ahead of House Rules and Reno Rumble. With such upheaval in the audience numbers it was Seven that emerged as the winner of the night. Seven News (1.15m / 1.05m) led for Seven then Home and Away (811,000), House Rules was second in its slot (781,000), Criminal Minds (670,000 / 481,000) and Million Dollar Minute (587,000). Nine News (1.08m / 1.05m) was best for Nine then A Current Affair (1.00m), Reno Rumble was third in its slot (741,000), Hot Seat (693,000) and The Amazing 90s (491,000). Forever was 290,000 / 227,000. MasterChef Australia (1.04m) won its timeslot again for TEN. The Project was 605,000 / 464,000, TEN Eyewitness News was 596,000, Wonderland was 535,000 and The Good Wife was 296,000. ABC News (843,000) topped ABC then 7:30 (698,000), The Weekly (570,000), QI (550,000), Agony (452,000) and Antiques Roadshow (338,000). 8MMM was 213,000. Struggle Street (828,000) was easily the best performer on SBS ONE then Sacred Wonders of Britain (334,000) and SBS World News (Late: 201,000 / 145,000). GO!’s Big Bang Theory ruled multichannels at 284,000. I found Struggle St an emotional roller coaster. This was raw, I could not tear my eyes away from it. These people are human beings living their lives. Do not judge them from your own point of view nor think you are any better than them, you are just lucky not to be born into this cycle. Good luck to all involved. Struggle street beat House Rules and Reno Rumble, who would of thought that before this show aired? Surely now the networks realise that confronting documentaries like Struggle Street are worth considering in their schedules instead of a bombardment of mindless reality shows. I watched it last night for the first time and couldn’t get through it all. It was extremely depressing. Not sure how people can watch it and be entertained by it. Not surprised that Ch9 are doing their own version of it now too. I wont be watching either of them. Struggle Street deserved the ratings it received in my opinion. It was an excellent documentary, despite the fact that the narration was somewhat annoying. I’m not sure why so many people want to watch bogans struggling to survive in yet another episode of Reno Rumble . Ahh yes, thanks for that. Struggle Street was very hard to watch. Not because of the characters or their stories but because of the insufferable, condescending, heavy handed, over-written narration. It was off-putting and detracted from what could have been a well made documentary. Is Rumble starting to crumble? I think there’s something highly suspicious about Struggle Street. I kept noticing that the camera was always conveniently around when trouble hotted up. It looks like some of it is staged, especially the storyline with Ashley and his meth-addicted son. Aren’t there journalistic standards for dealing with people who are not in control of their actions? Where is the line between documenting and participating? Agree – was a bit suss at times. Peta is an absolute saint for dealing with the endless hardships and cr*p in her life so calmly and with such dignity. She is a such worthy candidate for some time away, ( from the family including her husband), for a weekend of pampering or even a holiday. Perhaps one of the networks could make it happen. Would like to see a followup of SS in 6 months or a years time to see how they are all going. Will, the Aboriginal man is an especially interesting character. Found his matter of fact response,” If I’m still here”, when asked what he would be doing in10 years time, incredibly sad. What you are seeing is not a random sample – it’s called editing. They’re not going to show the boring bits. Surely you understand how these fly-on-the-wall docos are made? They prob shot hours of footage every day for an extended period. Events presented in a single hour are likely to have occurred over several weeks. I know how editing works. But c’mon – those scenes with Ashley and his son (and the other hangers-on) were clearly staged. The camera just happened to be in the back of the sister’s car? A drug dealer doesn’t mind being filmed? Someone on a meth binge happens to turn up when he looks like he can’t take three steps without falling down? And the woman with no front teeth was clearly hamming it up with her temper tantrums in public. It looks like something from an episode of A Current Affair. Nothing suspicious, just the nature of an observational documentary with a long filming period. Those poor editors must’ve seen some pretty horrific stuff considering what made it air. All the % shares reported here are from the consolidated figures for last week. SBS actually fell from last weeks consolidated figures so even the headline is wrong. OzTAM has just reissued numbers after an error on their part, so I am seeking to amend. Numbers in this story are correct (including the headline). OzTAM has reissued data for the shares incorrectly labelled on the ratings post. Unfortunately I am having some tech probs today (hello, timing) so I will update that post as soon as I can and fix closed comments. Good numbers for Million Dollar Minute. I hope Seven keep it. Wonderland’s numbers are lifting as it comes to a close (and despite Struggle Street airing at the same time). It’s a pity we don’t know it’s fate as the finale is about to air. It will be a pity of storylines are left open. Too many ‘new’ stories have emerged in the last few weeks and I doubt will resolve next week. Yes apologies for inconvenience, due to a tech problem. I agree Wonderland is finding its feet and despite some people saying it is dross I really enjoy it. I would like to see series One repeated sometime in the not too distant future as I only really caught up with the show from season two. Do you know if it had any overseas sales ? Struggle Street was a real eye-opener. No wonder they didn’t want it to go to air. I’d be disgusted and ashamed of myself too if I behaved like that, in front of the camera or not. And they want more funding for the area ! !